In classification tasks with imbalanced datasets the distribution of examples between the classes is uneven. However, it is not the imbalance itself which hinders the performance, but there are other related intrinsic data characteristics which have a significance in the final accuracy. Among all, the overlapping between the classes is possibly the most significant one for a correct discrimination between the classes. 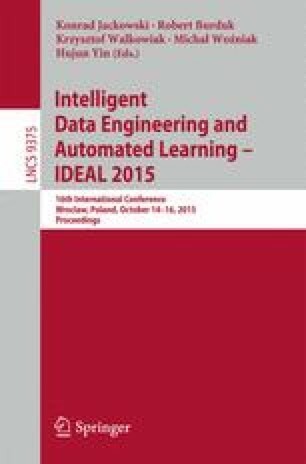 In this contribution we develop a novel proposal to deal with the former problem developing a multi-objective evolutionary algorithm that optimizes both the number of variables and instances of the problem. Feature selection will allow to simplify the overlapping areas easing the generation of rules to distinguish between the classes, whereas instance selection of samples from both classes will address the imbalance itself by finding the most appropriate class distribution for the learning task, as well as removing noise and difficult borderline examples. Our experimental results, carried out using C4.5 decision tree as baseline classifier, show that this approach is very promising. Our proposal outperforms, with statistical differences, the results obtained with the SMOTE + ENN oversampling technique, which was shown to be a baseline methodology for classification with imbalanced datasets. This work was supported by the Spanish Ministry of Science and Technology under projects TIN-2011-28488, TIN-2012-33856; the Andalusian Research Plans P11-TIC-7765 and P10-TIC-6858; and both the University of Jaén and Caja Rural Provincial de Jaén under project UJA2014/06/15.